Do You Make These 6 Mistakes In Your Body Language? When I was a teenager, my parents always insisted on taking lots of photos and home videos. I hated seeing how I acted in those days. I was always the quietest one, barely able to control my actions and reactions. Usually I thought I was a little shy, almost normal, but seeing those videos I was embarrassed to see how much different and insecure I actually was compared to other people. I wince inside, thinking back to those days. Over the years, I realized there are some habits almost all shy and antisocial people have in common that make other people think they’re loners. If that’s not bad enough, most shy people aren’t even aware of what they are. The habits are automatic and subconscious. That’s why I was always surprised when I saw how I actually acted in real life. But the good news is, once you see what these habits are, you can make adjustments to how you act and become more comfortable in your own skin. After you start to see what you’re doing wrong, you’ll have to consciously fix it. But after a while, it becomes habit and confident body language will become natural to you. You want to get to the point where you don’t even have to think about it anymore. Being insecure makes you want to “watch out” for anything that is going on around you. Your eyes constantly dart everywhere, and you probably don’t even realize it, unless someone videotapes you. The opposite of this is strong, relaxed eye contact. No matter what you believe, people DO make eye contact. Even with complete strangers. It only makes you uncomfortable, not the other person. This is the main thing shy people do when they’re really nervous. First of all, you have to realize when you are doing it, and stop. Plant your feet in one spot, relax your arms at your sides, and take your hands off of your face. You have to learn to relax in social situations. The best way to do this is to act like you are already relaxed on the outside. Social people let words FLOW out of their mouth. They never go back to a word they mispronounced and repeat it. The real problem here is that social pressure gets to your head, and makes you talk differently. I’m sure there are some people who you have no problem talking smoothly to. To fix the problem of stumling over words, you have to increase your tolerance to being in social situations. Most shy people have a very limited range of expression. This goes for their voice and their body language. They aren’t confident enough to make broad, sweeping gestures, dance, or have a wide range of tonality in their voice. One quick tip I can give you is practice. Practice making gestures in the mirror. See how tentative gestures make you look shy, and how BIG gestures make you look like a regular person. You can’t fake body language. What you think on the inside will broadcast on the outside. From now on, start from the inside. Try to feel relaxed and calm on the inside, instead of trying to hide your anxiety and nervousness. There are a whole lot of insecure habits shy people have that they can't really control. The only way to stop doing them is to not feel insecure in the first place. This type of improvement usually takes time, but it's what you should be ultimately aiming for. Whatever you do, don’t look down. A lot of shy people get into the habit of looking at the ground. They “watch out” for obstacles in their way. Try not looking down for a day. At first you may be scared of tripping, but soon you’ll get used to it. It’s all about breaking the habit. Keep your chin up, ALWAYS, and your posture straight but relaxed. One thing you’ll find, is that by acting confident on the outside, you’ll soon start feeling more confident on the inside, all the time. Liked This Article? 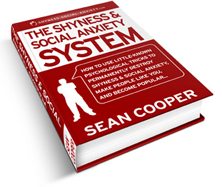 Enter your email below to get my latest strategies and tactics on overcoming shyness and social anxiety sent straight to your inbox. When you sign up, you'll also get instant access to a free report I wrote called "The 3 Biggest Mistakes Shy and Socially Anxious People Make." Would Being Good-Looking Cure Your Shyness or Social Anxiety? How To Become Confident... Even If You’re Smart!